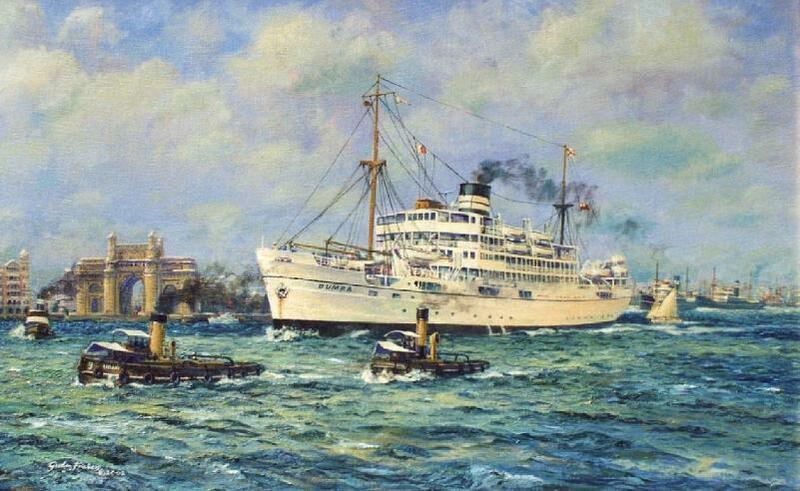 50 x 81 cms (20″ x 32″), Oils, Commissioned to celebrate Robin’s earliest times at sea. 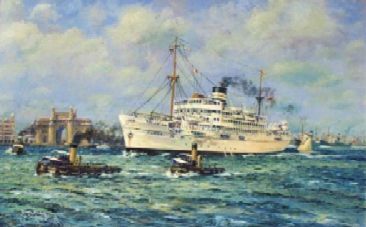 This painting shows “Dumra” as Robin requested, in a rising South West monsoon, having just cast off her tugs. Robin started his sea going career as a cadet onboard “Dumra“. In the background we see many sights familiar at the time, some still in place, the massive Gateway of India, the Taj Mahal Hotel, local craft & 2 B.I. “I” class freighters. It even shows the cabin window were Robin sweated out his early voyages, alas, only one dead cow shown in the harbour! Bombay has reverted to its original name, Mumbai. For more see Further reading, Useful facts + excellent stories about [CF7_get_post_var key='title'].